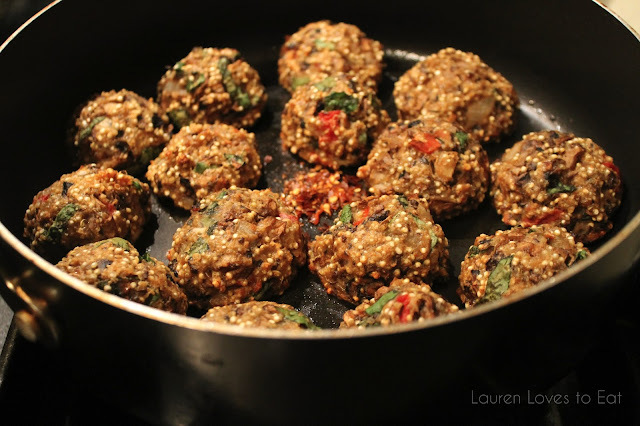 When I first saw Nisha's post about these quinoa meatballs on her blog Honey What's Cooking, I was salivating. I then asked my bf and sister if they didn't think quinoa meatballs sound amazing. They were both unimpressed. They're meat lovers and not as interested/annoying as I am about healthy eating. (Every time I comment on there being too much sodium in something, my sister rolls her eyes). Anyway, so these meatballs turned out perfectly. Go make them. Seriously. Tonight. Makes 15 meatballs. Comfortably serves 4. 1/4 cup & 2 tbsp dry quinoa (Try to use pre-washed quinoa. There's no bigger nightmare than trying to wash these little guys). 1/2 tsp crushed red pepper flakes (I used a tiny bit less because I'm scared of too much spice). I ended up making the marinara sauce, which was delicious but note that it will take an extra 2-3 hours, so make sure to start it ahead of time! I halved the recipe so that instead of making 4 servings, it would be 2. A little more would have been better for covering the meatballs in though, so here is the full recipe, which I'd suggest using if using for the portions of the meatball recipe. 1/4 cup chopped fresh basil (I tore the basil into small pieces instead of chopping, because I really wanted to taste the flavor). In a large saucepan, saute the onion in the olive oil for around 20 minutes on low heat. Add the garlic and saute for another 10 minutes. Add the tomatoes and herbs. Mix well and cook on low for approximately 2 hours. (I cooked this for 1 hour because I wanted to use the marinara sauce as soon as the meatballs were ready for it). When the sauce has thickened, finish it off with the balsamic vinegar or red wine and allow to simmer for 5 more minutes. (Skipped this step). Finish off with the sea salt. 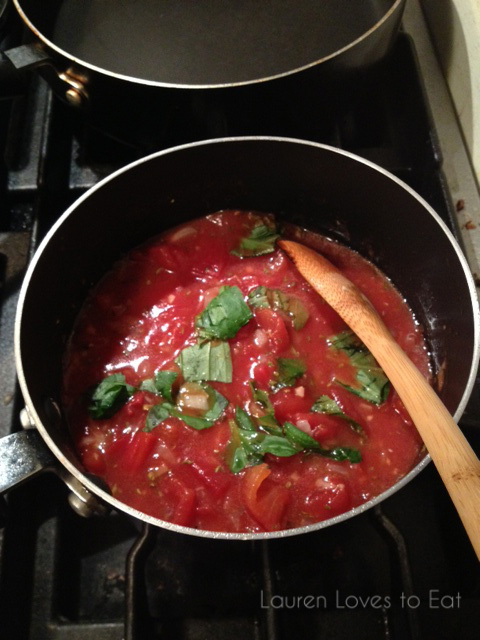 A relatively simple recipe for an amazing sauce! We were quite pleased with the results. Bring the quinoa to a boil in 1/3 cup water, then turn down to simmer for 10-15 minutes. The quinoa should be translucent when it's ready. Heat large skillet on medium heat, and add 2 tbsp of extra-virgin olive oil and red pepper flakes. Cook for a few minutes. Add onions, and salt and pepper to taste. Add garlic and thyme for approx. 30 seconds. Add mushrooms and sprinkle some salt. Cook until mushrooms brown. Approx. 10-12 minutes. Add 3 tbsp marinara sauce. Stir well, then turn off stove. Combine the mushrooms and quinoa in a mixing bowl. Grate parmesan cheese and chop/tear some basil. Add the cheese and basil and mix well. Coat a baking tray with canola oil. Sprinkle some water on your hands (this prevents the mixture from sticking to you), and then form the meatballs with approx. 1 inch diameters, and place onto tray. Bake for 15-25 minutes. 25 was perfect for mine. Start boiling water for the pasta. (Make sure to cook al dente, since you will be putting the pasta into the pan later with the meatballs and sauce). Heat the skillet on medium, and add extra-virgin olive oil and crushed red peppers, wait 3-5 minutes. Spread out the meatballs onto the pan. Add as much of the marinara sauce that will fit into the pan as well (any extra can be added to bowls when serving later). 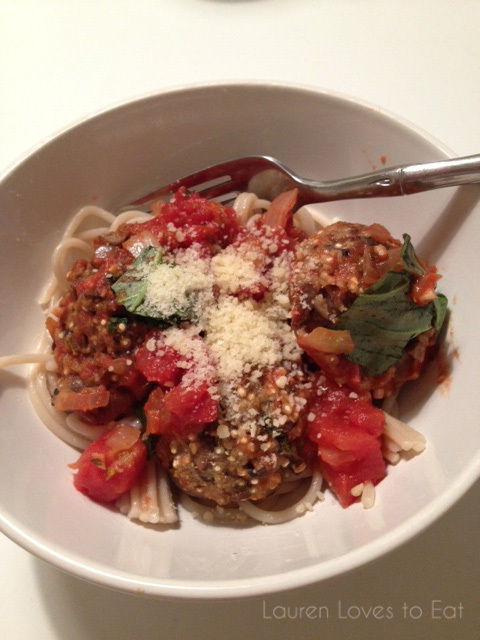 Add handful of basil and sprinkle of salt, and gently stir (try to keep the meatballs in tack!). Add the pasta when ready into the pan and continue to stir gently. Oh, and my sis and bf ended up loving these. I think my bf finished 8 meatballs on his own. We call him "Juggie", short for "Jughead" for a reason! Haha Fine but whenever he does chow down on everything I call him Juggie too! These look amazing, Lauren! I love quinoa. If you have other quinoa recipes, please share them with me! These were fantastic! I ended up using black beans instead of mushrooms to please my mushroom-hating husband, and he LOVED them! So happy to hear!! Mushrooms are so good though.. your husband is missing out!